Optimal management for alcoholic liver disease: Conventional medications, natural therapy or combination? Author contributions: Kim MS, Ong M and Qu X contributed to writing the manuscript; Kim MS produced the figures and Ong M thoroughly edited the manuscript. Conflict-of-interest statement: The authors declare no conflicts of interest. Alcohol consumption is the principal factor in the pathogenesis of chronic liver diseases. Alcoholic liver disease (ALD) is defined by histological lesions on the liver that can range from simple hepatic steatosis to more advanced stages such as alcoholic steatohepatitis, cirrhosis, hepatocellular carcinoma and liver failure. As one of the oldest forms of liver injury known to humans, ALD is still a leading cause of liver-related morbidity and mortality and the burden is exerting on medical systems with hospitalization and management costs rising constantly worldwide. Although the biological mechanisms, including increasing of acetaldehyde, oxidative stress with induction of cytochrome p450 2E1, inflammatory cytokine release, abnormal lipid metabolism and induction of hepatocyte apoptosis, by which chronic alcohol consumption triggers serious complex progression of ALD is well established, there is no universally accepted therapy to prevent or reverse. In this article, we have briefly reviewed the pathogenesis of ALD and the molecular targets for development of novel therapies. This review is focused on current therapeutic strategies for ALD, including lifestyle modification with nutrition supplements, available pharmacological drugs and new agents that are under development, liver transplantation, application of complementary medicines, and their combination. The relevant molecular mechanisms of each conventional medication and natural agent have been reviewed according to current available knowledge in the literature. We also summarized efficacy vs safety on conventional and herbal medicines which are specifically used for the prevention and treatment of ALD. Through a system review, this article highlighted that the combination of pharmaceutical drugs with naturally occurring agents may offer an optimal management for ALD and its complications. It is worthwhile to conduct large-scale, multiple centre clinical trials to further prove the safety and benefits for the integrative therapy on ALD. Core tip: The aim of this article is to review the impairment of hepatocellular dysfunction in alcoholic liver diseases and their prospective managements. Specifically, we focused on the natural therapies with their efficacies and safeties. Moreover, we summarized molecular mechanisms of herbal therapy to treat alcoholic liver disease (ALD). With evidence-based natural therapy, this article highlighted that the combination of pharmaceutical drugs with naturally occurring agents may offer an optimal management for this complex liver disease. It is worthwhile to conduct large-scale, multiple centre clinical trials further to prove the safety and benefits for the integrative therapy on ALD. Alcohol is a psychoactive substance and has been widely used in many cultures for centuries. Alcoholic abuse causes a large range of diseases and is also a social and economic burden in world societies. Reduction of alcohol consumption is now becoming the global strategy, with attempts to define “harmful use” of alcohol by the World Health Organization (WHO) to reduce the associated morbidity and mortality. Alcohol intake is a principal etiological factor in chronic liver diseases. Alcoholic liver disease (ALD), which initially manifests as hepatic fat accumulation, followed by an inflammatory response to induce final stage liver failure, is now a deleterious health problem. Alcohol abuse accelerates various types of liver diseases, such as alcoholic fatty liver disease (AFLD), alcoholic steatohepatitis, alcoholic hepatitis (AH), progressive fibrosis, liver cirrhosis and liver failure. Patients with ALD, especially with alcoholic cirrhosis, are associated with increased risk of hepatocellular carcinoma (HCC)[3,4]. The prevalence of ALD has increased in the last years, parallel with the increasing alcohol consumption in the western world as well as in Asian counties. According to the WHO report in 2011, chronic alcohol consumption results in approximately 2.5 million deaths each year with much of the burden related to ALD. Though ALD significantly contributes to the rising morbidity and mortality statistics and related health expenses, there is a lack of effective treatments for ALD, especially cirrhosis and HCC. Abstention from alcohol may reverse the early stage of ALD to a normal condition. The treatment for ALD with conventional medicines, mainly pharmaceutical medications, has limited success with side-effects. Recently, natural medicines, which mainly apply herb-derived agents, are emphasized as alternative therapies to manage the various alcohol-related liver diseases. It is the aim of this article to provide an overview of understanding the mechanisms of ALD, which could generate therapeutic interventions with conventional medicines, natural therapies and their combinations to reverse or retard the progression of ALD. Pathogenesis of ALD is multifactorial. Strategically, the liver is the most important organ to target as about 90% of alcohol intake is metabolized by the liver. Alcohol consumption can cause fatty liver by disrupting hepatic lipids and glucose metabolism. Furthermore, ethanol and its oxidative and non-oxidative metabolites have direct toxic effects on the liver. Histologically, fatty liver, or HS, is a malfunctioned fat accumulation in the parenchymal cells of the liver. HS is a reversible lesion. Fibrosis (or scar formation) is the subsequent result if liver injury persists. Fibrosis determined by biopsy increases the likelihood of progression to cirrhosis and end-stage liver disease. Biochemically, alcohol abuse contributes to a serious complex phenomenon involving different molecular and biological mechanism to induce ALD. Many hypotheses have been investigated and established to explain the pathogenic mechanisms of ALD. These include: (1) activation of alcohol dehydrogenase (ADH) and aldehyde dehydrogenase (ALDH) to cause the over generation of acetate; (2) induction of cytochrome P450 2E1 (CYP2E1) for alcoholic oxidative stress and hepatotoxicity; (3) abnormal lipid metabolism by increasing fatty acid (FA) synthesis and decreasing of FA oxidation; (4) hepatic inflammation indicated by an increase of tumour necrosis factor-α (TNF-α) and cytokine release; (5) induction of hepatocyte apoptosis and subsequent activation of Kupffer cells; (6) increased hepatic levels of cellular fibronectin and tissue growth factor-β (TGF-β) related to the activation of hepatic stellate cells; and (7) ethanol-induction of gut endotoxins[13,14]. 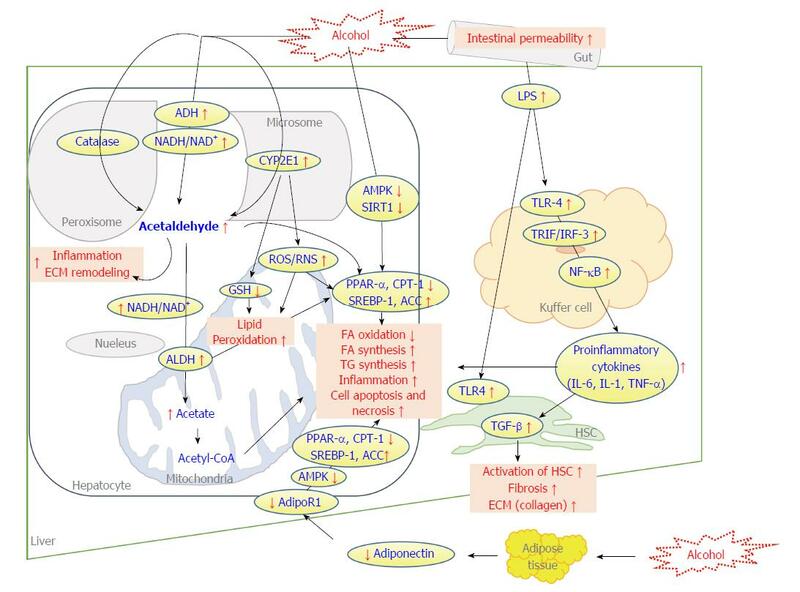 Proposed mechanisms impacting hepatocellular dysfunction by alcohol exposure within ALD pathogenesis are summarized in Figure 1. To further improve current strategies for managing ALD, a deeper understanding of the pathomechanisms of the disease is needed. Various curative approaches based on these mechanisms could prevent the progression of ALD and its downstream sequelae. Figure 1 The molecular mechanisms of alcohol-related liver pathogenesis and therapeutic targets. Adapted from references[8,13,159]. When alcohol intake is chronic and heavy, alcohol oxidation occurs via cytochrome P450s, resulting in increased levels of CYP2E1, which in turn causes oxidative stress through the generation of ROS which are responsible for lipid peroxidation and alcoholic liver injury. ROS also negatively regulates the activation AMPK and leads to overexpression of SREBP-1, resulting in an increase of de novo lipogenesis. GSH also has been reported to its depletion by CYP2E1 followed by the development of oxidative stress. Alcohol consumption negatively affects adiponectin secretion from adipocytes then causes inactive AMPK pathway, leading to elevated de novo lipogenesis and inflammatory process in the liver, while simultaneously decreasing fatty acid β-oxidation and contributing to hepatocyte necrosis. The red font indicates the end-point of pathology in the liver. ACC: Acetyl-CoA carboxylase; ADH: Alcohol dehydrogenase; AdipoR1: Adiponectin 1; ALDH: Acetaldehyde dehydrogenase; AMPK: 5’ adenosine monophosphate-activated protein kinase; CYP2E1: Cytochrome P450 2E1; CPT-1: Carnitine palmitoyl-transferase-1; ECM: Extracellular matrix; FA: Fatty acid; GSH: Glutathione; HSC: Hepatic stellate cells; IRF-3: Interferon regulatory factor 3; IL-6/IL-1: Interleukin 6 and 1; LPS: Lipopolysaccharide; NADH/NAD+: Nicotinamide adenine dinucleotide hydrogen, nicotinamide adenine dinucleotide; NF-κB: Nuclear factor kappa; ROS: Reactive oxygen species; RNS: Reactive nitrogen species; PPAR-α: Peroxisome proliferator-activated receptor-α; SIRT1: Sirtuin 1; SREBP1: Sterol regulator element binding protein 1; TG: Trigylcerides; TLR-4: Toll-like receptor 4; TNF-α: Tumour necrosis factor-α; TGF-β: Tissue growth factor-β. General management of ALD should initially be abstinence from alcohol. This becomes increasingly vital as the condition progresses. However, this is largely dependent on patient willingness and compliance. Currently, there is no universally accepted therapy to prevent or reverse the progression of ALD. Successful managements include lifestyle modification with the correction of nutritional deficiencies, conventional drugs, liver transplantation, application of complementary medicines, and their combinations[15,16]. Lifestyle intervention initially entails the abstinence from alcohol. Abstinence limits the development of hepatic steatosis (HS) and prevents further ongoing liver injury, fibrosis and the possibility of HCC. It was reported that abstaining from alcohol improves the prognosis of ALD patients and prevents advancement to hepatic cirrhosis by reducing portal pressure and histological lesions[17,18]. However, long-term alcohol abstinence heavily relies on patient compliance and willingness and therefore may need to be accompanied with psychological therapy or social support. Cognitive behavioral therapy, one of the psychotherapies, reduces the risk of alcoholism and motivates patients to take responsibility and avoid relapse. Pharmacotherapy in combination with psychosocial interventions also encourages patients to sustain abstinence from alcohol. Naltrexone and Acamprosate have been used to manage alcohol abuse in chronic heavy drinkers. Disulfiram has also been approved by the FDA for the management of alcoholism and is broadly utilized despite unclear results from clinical trials. Disulfiram is an acetaldehyde dehydrogenase inhibitor and may cause an increase of serum acetaldehyde by changing the alcohol metabolism. Disulfiram, therefore, needs to have supervised administration. Furthermore, reducing alcohol consumption, but not completely stopping has also displayed favourable results for the survival of patients with ALD. Other important lifestyle changes can include smoking cessation, adopting a balanced diet and weight control if relevant. Smoking is an independent risk factor for increasing the severity of ALD and its progression to fibrosis and HCC[23,24]. Obesity is another risk factor that can accelerate the progression of ALD as it alone is linked to fatty liver disease and cirrhosis. Malnutrition is another major complication of ALD as poor dietary intake from anorexia, vomiting, mal-digestion, iatrogenic causes, metabolic disturbance, hypermetabolic state, impaired protein synthesis, or mal-absorption can lead to malnutrition and contribute to the disease[26,27]. Nutritional supplementation may address calorie, protein, and nutrient intake to support hepatocyte regeneration. Protein energy malnutrition can be detected with symptoms of muscle wasting, edema and loss of subcutaneous fat. It is recommended that patients with ALD have a daily intake of 1.5 g/kg and 35-40 kcal/kg per day of protein. Supplementation with vitamins such as folate and thiamine should be considered if their deficiencies are detected[16,30]. A discussion concerning micronutrient supplementation is necessary beyond the scope of this article. Nevertheless, an example of micronutrient deficiency related to ALD is seen in zinc deficiency as zinc supplementation has shown to improved ALD by enhancing the activity of ADH and suppressing CYP2E1 in animal models[31,32]. In summary, nutritional status should be balanced in individual cases of malnutrition. Although patients living with ALD are mostly treated with strategies to encourage abstinence from alcohol, some patients may need to be accompanied with pharmacological treatment approaches. There are several drugs that have been widely used and reviewed with efficacy, molecular mechanisms (Figure 1), and safety. Table 1 summarizes the effects and mechanism of conventional medicines. Table 1 The information of effects of current conventional medicines on the treatment of alcoholic liver disease. Medicine/compound Type of model Dosage/duration Effects Mechanisms Ref. AH: Alcoholic hepatitis; AMPK: 5’ adenosine monophosphate-activated protein kinase; ALT: Alanine transaminase; AST: Aspartate aminotransferase; bw: Body weight; COX-2: Cyclooxygenase-2, FA: Fatty acid; FAS: Fatty acid synthase; GSH: Glutathione; HepG2: Hepatoma G2 cell-line; HO-1: Heme oxygenase-1; HSC: Hepatic stellate cells; IL-6: Interleukin 6; IL-8: Interleukin-8; LPS: Lipopolysaccharide; mRNA: Messenger ribonucleic acid; P13K: Phosphoinositide 3-kinase; PAI-1: Plasminogen activator inhibiter-1; PPAR-α: Peroxisome proliferator-activated receptor-α; RCT: Randomized controlled trial; RMT: Respiratory muscle training; SIRT1: Sirtuin 1; SREBP1: Sterol regulator element binding protein 1; TG: Triglycerides; TGF-β: Tissue growth factor-β; TNF: Tumour necrosis factor; TNF-α: Tumour necrosis factor-α. Corticosteroids were one of the first pharmacologic therapies investigated for the treatment of AH and many researchers have extensively studied their use for patients with ALD. The underlying mechanism of action is thought to be the ability of corticosteroids to ameliorate the characteristic inflammatory response by decreasing TNF-α, IL-6, and IL-8[34,35] and also to suppress the formation of acetaldehyde adduct metabolites with inhibition of collagen. Prednisolone, belonging to the corticosteroid family, with a dose of 40 mg/d for 28 d followed by tapering over 2-4 wk is recommended to treat severe alcoholic hepatitis (AH). Another recent published clinical trial randomized 101 acute AH patients to corticosteroids (e.g., prednisone 30 mg/d or methylprednisone 24 mg/d intravenously) and at 30 d, survival was 70% in corticosteroid group when compared to the control (37/53). Although, corticosteroids have been established as a common treatment for ALD, the data on treatment duration and efficacy of corticosteroids in ALD are conflicting. Long-term usage of corticosteroid seems to enhance the efficacy while others have showed no benefit of corticosteroid therapy after more than 6 mo. Glucocorticoid has been demonstrated to decrease serum bilirubin levels, which is shown to be a clinically useful indicator[39,40]. Using corticosteroids in severe AH, however, carries contraindication including sepsis, hepatitis B, hepatorenal syndrome and gastrointestinal (GI) bleeding[37,41]. Pentoxifylline (PTX), has been thought of as an appropriate substitute to replace corticosteroid treatment in patients with severe AH when there is a contraindication to steroids and is suitable for short-term use[42,43]. The exact mechanism of PTX is not entirely clear. Anti-TNF actions may explain part of its protective effect for ALD. Interesting results have proved that 100 to 1000 μg/mL of PTX inhibited TNF expression by murine peritoneal exudate cells treated with endotoxin 1 μg/mL and PTX treatment significantly reduced serum TNF-α levels in murine in vivo. Despite these positive efficacies, treatment with PTX still remains controversial. It has been reported that no significant differences between PTX and corticosteroid treatment groups, or their combination were observed. Meta-analysis also argued that PTX decreased the hepatic-related mortality, but trial sequential analysis did not support this result. Nevertheless, the European Association for the Study of the Liver and the American Association for the Study of Liver Diseases have both recommended that PTX should be considered when AH patients have contraindications to corticosteroid treatment. S-adenosyl-L-methionine (SAM) operates as a methyl donor and contributes in the synthesis of the major cellular antioxidant, glutathione (GSH). In patients with AH and cirrhosis, decreased hepatic SAM, cysteine, and GSH levels caused by abnormality of hepatic gene expression in methionine and GSH metabolism is observed. SAM deficiency arises in early stages of ALD. SAM supplementation can however increase reduced SAM concentrations and reverse liver injury and mitochondrial damage. SAM works to reduce the severity of oxidative stress and hepatic stellate cell (HSC) activation by inhibiting hepatic TGF-α signalling pathway in an ethanol-lipopolysaccharide-induced fibrotic rat model. SAM supplementation has also shown its benefit in 220 patients with chronic hepatitis and cirrhosis in a prospective, double-blind, placebo-controlled trial. Other studies have contradicted these findings, as one demonstrated that there was no significant difference between SAM and placebo in liver biopsies and no improvement to liver histopathology scores or steatosis, inflammation, fibrosis in ALD patients. Large and high-quality clinical trials are needed to further prove clinical benefits of SAM in ALD. Peroxisome proliferator-activated receptor-alpha (PPAR-α), a member of the nuclear receptor superfamily and mainly expressed in liver, participates in the regulation of the transcription of genes involved in fatty acid (FA) oxidation, FA transportation, and export of free fatty acid. Alcohol intake inhibits FA oxidation via the suppression of PPAR-α in hepatocytes. PPAR-α agonists, are therefore a potential therapy to reverse fat accumulation in AFLD. Many PPAR-α agonists have been assessed as a therapeutic approach to patients with ALD owing their positive efficacies to their anti-inflammatory and hypolipidaemic effects, as well as the induction of FA oxidation. Adiponectin and its receptors, recently, are a new prospective target to manage ALD through PPAR-α, TNF-α and sirtuin 1 (SIRT-1)-related pathways. Thereby, drug discovery of adiponectin agonists may be a potential strategy to manage ALD. PPAR-α plays a pivotal role in the regulation of adiponectin level and rosiglitazone, one of the PPAR-α, agonists has shown to increase the circulating level of adiponectin and enhance hepatic adiponectin receptors (AdipoRs) in ethanol-fed mice. These increments are correlated with the activation of the SIRT-1-AMPK signalling system. Carvedilol, a beta-blocker, has been recently reported to attenuate the development of AH by decreasing hepatic trigylceride (TG) levels and lipid droplets within hepatocytes through down-regulation of fatty acid synthase (FAS) and sterol regulator element binding protein 1 (SREBP-1), and up-regulated PPAR-α. Carvedilol also prevented ethanol-induced thickening of zone 3 vessel walls and reduced HSC activation, decreased induction of TGF-β1 and collagen. Metformin, an antidiabetic drug, has recently been discovered to improve HS by lowering fat accumulation and liver damage in mouse models of acute and chronic alcohol stimulation. This was through the prevention of the up-regulation of plasminogen activator inhibitor-1 and improvement of insulin resistance and liver injury by increasing PPAR-γ and adiponectin levels[57,58]. Although CYP2E1 inhibitors prevent alcohol-induced liver damage, compounds, which have been available in commercial markets, have been too toxic for clinical use. Polyenylphosphatidylcholine (PPC), an innocuous mixture of polyunsaturated lecithins, extracted from soybeans, was recently showed to reduce CYP2E1 activity and also attenuate hepatic oxidative stress and fibrosis. However, one randomized controlled trial (RCT) did not confirm the clear association with the progression of liver fibrosis. Further studies into the effect of PPC on ALD should be encouraged. Clomethiazole, another potential CYP2E1 inhibitor, has also shown to protect the liver from injury in ethanol-fed rats and humans[61,62]. The liver and GI tract shares a reciprocal relationship and therefore establishing healthy gut microbiota has been put forward as a strategy in the treatment of ALD. Lipopolysaccharide (LPS) binds to CD14 in Kupffer cells which reacts with toll like receptor-4 (TLR-4) to activate and release pro-inflammatory cytokines genes. LPS signaling and gut microbiota can be adjusted by probiotics, prebiotics and TLR-4 antagonists to treat ALD. In animal experiments, treating with antibiotics or lactobacillius improved ALD by reducing the gut microflora which suggests that gut-derived endotoxin/LPS may be important in the study of ALD. The modified probiotic, Escherichia coli Nissle 1917 was shown to secrete pyrroloquinoline quinone (PQQ), which decreased lipid peroxidation and increased GSH to have an anti-inflammatory, anti-oxidant and anti-hyperlipidaemia effect in acute alcohol exposure in rats. LPS antibody may also benefit injury from LPS induced by exposure to microorganisms in the gut. The outcome of experimental studies has provoked the need to compare the effects of LPS antibodies when combined with corticosteroids for translation into clinical trials for AH. As mentioned, oxidative stress is regarded as a key player in the pathogenesis of ALD with increasing evidence of its importance, such as products of lipid peroxidation being detected in both heavy drinkers and ALD patients. It, therefore, has been anticipated that anti-oxidant therapy would benefit the outcomes for ALD patients. In an animal study, metadoxine had preventative effects of lipid peroxidation and GSH depletion in human hepatocyte (HepG2), exposed with ethanol and acetaldehyde. In HSC, metadoxin also prevents the increase of collagen production and TNF-α secretion. In addition, some drugs have been used for alcoholic liver cirrhosis or fibrosis. Colchicine when administered (1 mg/d) to patients with chronic liver cirrhosis over a three year period displayed anti-fibrotic effects. Propylthiouracil (PTU), typically used as an anti-thyroid medication may also ameliorate liver fibrosis. PTU has been suggested as a therapeutic drug to treat alcohol-induced liver cirrhosis as it increases hepatic blood flow and also reduces oxidative stress in rats. Liver transplantation is an effective therapy and is the next viable option for ALD patients with alcoholic cirrhosis who have not responded to abstaining from alcohol. Liver transplantation proposes to be a rescue option for patients with decompensated liver injury and no response from pharmaceutical therapy. Liver transplantation is regarded as a final treatment option for end-stage ALD. However, many reviews have reported that relapse incidences following liver transplantation are common and generally occurs in approximately 10%-52%[73,74] of patients. Moreover, patients who have been treated with liver transplantation related to ALD display an increased likelihood of de novo cancer in other organs, especially, a high rate of cardiovascular complications[75-77]. In addition, the transplantation should be followed after six months of abstinence to avoid histological damage[78,79]. Chronic alcohol uses and subsequent injury to the liver involves various changes to cells and molecules that can compromise the metabolic capabilities of the liver. Therefore, medications that rely mainly on the liver for their metabolism and clearance should be used with caution as there is subsequently less elimination and higher plasma concentrations. Impaired drug metabolism may also relate to changes of the enzyme, CYP2E1 which is effected by chronic alcohol use. Additionally, in a cirrhotic liver, drug administration may also be compromised with an increased risk for adverse drug reactions. Furthermore, adverse reactions in the treatment of ALD may often occur due to individual differences such as food intake, genetic differences, age, gender and environmental factors including obesity and diabetes. Although it was found that there was no significantly increased risk of hepatotoxicity in patients with liver disease, there still should be considerable attention to dosage when medicating ALD patients to minimise the risk of adverse drug reactions and hepatotoxicity. Caution, for example, should also be taken when using corticosteroids and anti-TNF medications in the hospital setting due to an increased risk of immune-related events including pneumonia, staphylococcus septicaemia, candida septicaemia and GI bleeding. This outcome was seen in a previous study investigating the effects of infliximab and prednisolone which was terminated prematurely due to a significantly higher occurrence of severe infections in the treatment group when compared to placebo and prednisolone. Corticosteroids also increase the risk of coincidental bacterial infections, gastrointestinal bleeding, or renal failure indicating the need for more clinical evidence to confirm this safety issue. Metformin and alcohol combination may produce severe consequences as a side effect of lactic acidosis. This condition can generate when the blood has insufficient oxygen, which is required to transport the glucose throughout the body. Metformin also should be prudent in patients with cirrhosis due to arterial hypoxemia. Other drugs lack evidence in human models beyond preliminary trials due to toxicity or no significant treatment effect. This could perhaps be influenced by the high morbidity rates and short-term mortality associated with end stage ALD, especially acute AH. This highlights the need for complementary and alternative medicine (CAM) where side effects and potential for toxicity are significantly reduced. CAM encompasses a wide range of approaches with many advantages as it is readily available, has fewer side effects and is a natural way of healing with lasting effects when compared to conventional medicines. With these benefits, natural therapy and herbal medicines have attracted a lot of attention as a potential therapy for the treatment of ALD. It was found that 41% of outpatients with liver disease had utilized some form of CAM. In the US survey, Silymarin and garlic were reported as the most used herbs for liver disease with 12% and 8% respectively. Ginseng (6%), green tea (5%), gingko (5%), echinacea (5%), and St. John’s wort (4%) have also been reported. Other than silymarin, the only herb used specifically for liver diseases was licorice root (1%). Herbal medicines and formulations are commonly grouped according to country. This includes Traditional Chinese Medicine (TCM), Japanese Herbal Medicine, Ayurvedic Medicine (Indian Subcontinent), Traditional African Medicine, Traditional Medicines of the Amazonian Basin in South America, and Arab Traditional Medicine. In general, the markers to display the benefits of herbal products rely on serum/plasma enzymes such as alanine transaminase (ALT), aspartate aminotransferase (AST) and alkaline phosphatase (ALP). Other characteristics, including lipid lowering effects, anti-oxidant, anti- inflammation and anti-fibrotic effects are also used to show the hepatoprotective effects. This review may describe the potential role and effects of natural products in chronic ALD including biological properties and their beneficial effects. A summary list of natural compounds is shown in Table 2. Table 2 The information of effects of current natural medicines on the treatment of alcoholic liver disease. ACC: Acetyl-CoA carboxylase; AML12: Alpha mouse liver 12; AMPK: 5’ adenosine monophosphate-activated protein kinase; ALT: Alanine transaminase; AST: Aspartate aminotransferase; bw: Body weight; CCL4: Chemokine ligand 4; CD14: Cluster of differentiation 14 gene; COX-2: Cyclooxygenase-2; CPT-1: Carnitine palmitoyl-transferase 1; CYP2E1: Cytochrome P450 2E1; EGCG: Epigallocatechin-3-gallate; etOH: Ethanol; FA: Fatty acid; GSH: Glutathione; GSSG: Glutathione disulfide; HepG2: Hepatoma G2 cell-line; HO-1: Heme oxygenase-1; ICAM-1: Intercellular adhesion molecule-1; IFN-γ: Interferon-γ; IL-1: Interleukin 1; IL-6: Interleukin 6; IL-10: Interleukin-10; IL-18: Interleukin-18; iNOS: Inducible nitric oxide synthase; LDH: Lactate dehydrogenase; MDA: Malondialdehyde; NF-κB: Nuclear factor kappa; NOS: Inducible nitric oxide synthase; RCT: Randomized controlled trial; SIRT1: Sirtuin-1; TLR-4: Toll-like receptor-4; TNF-α: Tumour necrosis factor-α. Green tea is derived from the leaves and buds of Camellia sinensis. Green tea contains rich polyphenolic compounds and has pleiotropic effects including anti-oxidant, hypolipidaemic and anti-inflammatory actions. Green tea polyphenols (GTP) significantly ameliorated ethanol-induced hepatic necrosis. Furthermore, while ethanol significantly increased the accumulation of 4- hydroxynonenal, a product of lipid peroxidation and an index of oxidative stress, green tea extract down regulated this effect. This indicated that GTP protects alcohol-induced liver injury through preventing oxidative stress. The major tea catechins include epicatechin (EC), epicatechin gallate (ECG), epigallocatechin (EGC), and epigallocatechin gallate (EGCG) with EGCG being the major constituent of the catechins with numerous biological functions[89-91]. Our previous study showed total GTP and EGCG enhance glycogen synthesis and inhibit lipogenesis in hepatocytes. EGCG treatment also significantly decreased elevated serum ALT in alcohol-induced rats and normalised the activities of enzymatic anti- oxidants. Another study has reported that EGCG ameliorated plasma endotoxin levels in alcohol-induced female rats with endotoxemia, displaying anti- inflammatory effects through the inhibition of TNF-α, COX-2, and iNOS mRNA expression. EGCG also protected against liver impairment through the enhancement of FA oxidation with increased carnitine palmitoyl transferase 1 (CPT-1) levels. Despite much evidence supporting the effects of EGCG on ALD, clinical studies are still limited and large-scale human studies may be needed to confirm this effect. GTP, catechins may also increase HO-1 activity to reduce oxidative stress in human liver tissue (hHeps). Administering polyphenols prior to ethanol exposure reduced the diminishing of GSH to display a protective effect on liver cells by regulating the immune system and pro-inflammatory mediators such as TGF-β1. Silymarin (Milk thistle), which is one of the active compounds extracted from Silybum marianum (Asteraceae) is the most common type of CAM therapy for treatment of liver diseases. Silymarin is a complex mixture of polyphenolic molecules including 7 flavonolignans (silybinA, B, isosilybin A, B, silychristin, isosilychristin, silydianin) and 1 flavonoid (taxifolin). Silibinin, which is a semi-purified fraction of silymarin, has been shown to be a radical scavenger and a RCT with silymarin also improved survival from patients with alcoholic and non-alcoholic cirrhosis without any side effect. Another RCT was also conducted with the prospective effect of silymarin (140 mg/d) in AH. Mechanisms by which silymarin extracts ameliorate liver disease include anti- inflammatory, anti-oxidative, antifibrotic, and immune-modulating activities. Silymarin has retarded the development of alcohol-induced hepatic fibrosis in baboons by preventing collagen type I and decreasing histological progression to fibrosis. Silymarin also reduces the elevated serum AST and ALT levels, and decreases hepatic lipid contents in alcohol-induced fatty liver in rats. These effects may be through down-regulating the expression of NF-κB p65, ICAM-1 and IL-6 in liver tissue. However, Cochrane Database reviews have been unsuccessful in demonstrating the beneficial effect of silymarin on ALD. Further studies are needed to provide the appropriate data concerning efficacy. Betaine is another natural dietary compound, synthesized in vivo from choline and converts homocysteine to methionine. Betaine (trimethylglycine), a pivotal nutrient for humans, can be acquired from a wide range of foods and nutritional supplements. It attenuates AH by restoring phosphatidylcholine generation via the phosphatidylethanolamine methyltransferase pathway. Betaine also increases SAM, normalizing hepatocellular SAM:S-adenosyl-L-homocysteine ratio, resulting in the attenuation of fatty liver. The study of mitochondrial dysfunction in the progression of ALD has also been enforced by many research areas. Betaine gives a beneficial effect against loss of oxidative phosphorylation system proteins by alcohol, by preventing NOS2 induction and NO generation in male Wister rats with exposed to ethanol. The mechanism of betaine in liver is also involved in the suppression of endotoxin/TLR-4 signaling pathways. Betaine treatment decreased the levels of serum ALT, AST, endotoxin, TNF-α, IFN-γ, IL-18, and TLR-4, and improved the degree of HS and inflammation in liver tissues in rats with alcohol-induced liver injury. Glycyrrhiza glabra (Leguminosae), commonly named licorice root, is a perennial herb cultivated in temperate and subtropical regions of the world as well as central and South-Western Asia. Glycyrrhizin, as a main constituent in aqueous extract, is a conjugate of two molecules of glucuronic acid and one of 18β-glycyrrhetic acid. Glycyrrhizin is hydrolysed by intestinal bacterial into 18β-glycyrrhetic acid, which is reabsorbed into the bloodstream. Glycyrrhizin suppressed serum AST and ALT levels and histologically inhibited the spread of deteriorating areas in hepatocytes in an animal model of concanavalin A-induced liver injury. Moreover, the effects of Glycyrrhizin has extended to the attenuation of inflammation response by regulation of NF-κB and MAPK pathway and inhibition of TNF-α, ROS, and proinflammatory interleukins such as IL-6 and IL-1β[112,113]. Another beneficial effect of glycyrrhizin, from Potenlini compound, was shown in ethanol-CCl4 induced liver cirrhosis rats by decreasing serum ALT levels and normalising NF-κB binding activity[114,115]. In clinical trials, glycyrrhizin is mostly used to treat hepatitis C and interferon treatment. One clinical trial showed to lower level of ALT with 200 mg of glycyrrhizin for 5 d per week for approximately 10 years in hepatitis C patients. Glycyrrhizin has potential effects to cure various chronic liver diseases but large-scale, rigorously designed clinical trials for ALD is warranted. Ginseng, an ancient medicinal herb, has been popular as a tonic for the treatment of various diseases including diabetes and hepatic diseases. Ginsenosides, the main active constituent groups of all ginseng species, has been used as a supplementary medicine and is mostly responsible for the beneficial pharmacological effects in metabolic disorders and various cancer via its ability to boost immunity and its anti- inflammation function[118,119]. Ginsenoside Rb1, as the most abundant ginsenoside in P. ginseng has improved hepatic fibrosis induced by CCl4 by down regulation of hepatic prostaglandin E2 and TIMP-1. Ginsenoisde Rg1 showed to inhibit TNF-α-mediated NF-κB transcriptional activity in HepG2 cells with IC50 of 28.14 μmol/L and gene expression of iNOS and COX-2 inducible inflammatory enzymes. It was also reported that ginsenoside Rc (40 mg/kg) attenuates AFLD in alcoholic-fed ICR mice through the regulation of AMPK and MAPK pathways. Red ginsengs, which contain an abundance of ginsenosides, showed to improve chronic alcohol-induced histopathological changes and hepatic TG content through inhibition of the lipogenesis pathway and AMPK-SIRT1 activation in alcohol-fed mice. Red ginseng also reduced levels of TNF-α and IL-1β which were increased by alcohol consumption with a high fat diet in mice. Recently, compound K which is a metabolite form of ginsenoside Rb1 and Rc has been identified as an inducer to increase AMPK expression, resulting in reduction of lipid droplets and hepatic TG accumulation in high FA exposed human hepatocytes (Huh7). This compound had better efficacy to treat HS compared to metformin. With the hepatoprotective effects of many types of ginsenosides, these herbal components should be potential targets to improve liver damage caused by alcohol abuse. Fenugreek (Trigonella foenum graecum) seeds have been reported to have beneficial effects on enhancing the antioxidant apparatus. Fenugreek seeds also have been used in remedies for diabetes and high cholesterol in various traditional medicines and proven experimentally in diabetic humans. The polyphenolic extract of the seeds is the main constituent beneficial for the treatment of ALD according to many articles. In general, fenugreek seed polyphenols contain five different polyphenolic flavonoids, vitexin, tricin, naringenin, quercetin, and tricin-7-O-b-D-glucopyranoside. These polyphenols prevent the alcohol-induced toxic effect in human Chang liver cells through improvement of GSH/GSSG ratio. Interestingly, quercetin ameliorated ethanol-stimulated mitochondrial dysfunction by induced permeability transition though suppressing GSH depletion. This indicates a promising preventive strategy for ALD[130,131]. Fenugreek seed polyphenols also have demonstrated improvement to lipid profiles and collagen content in alcohol-fed rats. Compared to other herbal medicines, however, the clinical studies of fenugreek seed polyphenols are lacking evidence in metabolic disorders, especially in relation to ALD, suggesting the need for accurate standardization of polyphenols and their individual efficacy for the treatment of ALD. Curcumin, commonly called turmeric yellow and compound of curcuma longa, is a low-molecular weight polyphenol derived agent. It is commonly used in Ayurvedic medicine and has various pharmacological effects including anti-oxidative, anti- inflammatory, and hepatoprotective activities. This historical use of curcumin has prompted investigation into the hepatoprotective effects against liver damage induced by alcohol abuse and the molecular mechanisms, however the research in this area is still lacking. Curcumin has ameliorated malondialdehyde (MDA) and AST and improved GSH and heme oxygenase-1 (HO-1) induction in alcohol (100 mM) induced rat primary hepatocytes. Curcumin (400 mg/kg bw) has also been examined in alcohol-induced female Sprague-Dawley rats to show improvement by reducing the elevation of hepatic MDA, and the suppressing of NF-κB activation. Another similar result confirmed the inhibition of the expression of NF-κB-dependent genes by the supplementation of curcumin (75 mg/kg per day) for 4 wk in rats. Recently, low dosage of curcumin prevented HS compared with the alcohol control group with inhibition of dehydrogenase, ALDH2 as well as CYP2E1 activation. Curcumin also proved its anti-oxidant effect against ethanol-exposed mice by decreasing ROS generation. Despite the beneficial effects of curcumin in ALD, it is unfavourable to apply as a medical strategy due to its decreased bioavailability and rapid metabolism with systemic elimination in animals and humans, suggesting an investigation of more sophisticated pharmacokinetic improvements of curcumin such as curcumin phospholipid complex or curcumin nanoparticles[105,138]. Historically, some herbal blends have been commonly used for hepatic disorders around the world. Clinical trials to evaluate their efficacy are, however, challenging to demonstrate due to heterogeneous formulations and dosages. Moreover, these blends have not been regulated by the Food and Drug Administration. In this review, a few blends are evaluated in ALD. Herbal Medicine861 (HM 861) consists of 10 herbs, based on TCM including Salvia miltiorrhiza, Astragalus membranaceus and Spatholobus suberectus. HM861 has shown the inhibition of HSC proliferation and induction of HSC apoptosis in patients with chronic hepatitis. Moreover, the compound also suppressed tissue inhibitor metalloprotease 1 (TIMP-1) mRNA expression in HSC-T6 cells. In clinical trials, this herbal blend was tested for anti-fibrotic activity encompassing 107 patients with hepatitis B resulting in the drop of ALT levels to the normal range in 73% of patients. In a clinical trial, HM861 showed to improved fibrosis and early cirrhosis in 52 patients with HBV-related fibrotic patients with the hepatic inflammatory scores also decreased. More Cochrane reviews, however, are needed to confirm the efficacy of the blend in the treatment of ALD. TJ-9, also referred to as Sho-saiko-to in Japan or xiao-chai-hu- tang in China, containing 7 herbal constituents including: bupleurum root, pinellia tuber, scutellaria toot, jujube fruit, ginger rhizome, ginseng root, and glycyrrhiza root. The formula has been traditionally used for the treatment of liver diseases. Usually, the preparation contains 7.5 g of TJ-9 with the active components, baicalin and baicalein, responsible for the anti-oxidant activity. Although the exact of mechanism of TJ-9 is unknown, one anticipated mechanism may be exposed in the observation of stellate cells which has shown an inhibition of α-smooth muscle actin, type I collagen production, and cell spreading, indicating the suppression of HSC activation. TJ-9 has been associated with several cases of interstitial pneumonitis, especially when used with interferon for the treatment of chronic hepatitis. Liv-52, which is an Indian Ayurvedic medicine that has been used for the treatment of liver diseases, is a herbal preparation including Capparis spinosa (Himsara), Cichorium intybus (Kasani), Mandur bhasma, Solanum nigrum (Kakamachi), Terminalia arjuna (Arjuna), Cassia occidentalis (Kasamarda), Achillea millefolium (Biranjasipha), and Tamarix gallica (Jhavaka). It was originally used to treat ALD, but a recent RCT from Europe demonstrated a detrimental effect on advanced alcohol-induced cirrhosis. Contrastingly, an in vitro study, reported that Liv.52 improved PPAR-γ suppression and TNF-α expression in HepG2 cells. Another clinical study also showed the efficacy of LIV.52 in 26 cirrhotic patients for 6 mo with normalized serum ALT and AST levels compared to the placebo group. Although there are many positive effects of LIV.52 for the improvement of ALD, underlying molecular mechanisms are still necessary to support its potential function. In summary, many compounds are available on the open market to treat ALD, but their efficacy data is still not supported by clinical trials. Comprehension of herbal interaction with pharmacological medicines is also necessary to improve the treatment of ALD. More readily available on the market and popular than ever, CAM and herbal therapy are increasingly attractive treatments for chronic liver diseases with many advantages, such as low side effect and toxicity. Augmentation of herb-drug interaction has consequently followed stipulating dialogue between pharmaceutical experts and practician. Although there is strong evidence, supporting the use of herbal medicine for the treatment of ALD, combination therapy should be speculated for any safety issues. Magnesium isoglycyrrhizinate injection is one example of a drug containing glycyrrhizin and possesses effective and safe treatment for chronic liver diseases and down regulates the progress of pulmonary fibrosis. Glycyrrhizin also has been combined with matrine to improve CCL4-induced liver fibrosis through lowering levels of collagen and less HSC proliferation, suggesting the positive effect of their combination to protect against liver fibrosis. Recently, a combination of silymarin and SAM was evaluated in ALD markets with much promise. There have been some cases of adverse events and hepatotoxicity caused by herbal medicines. Xiao Chaihu Tang, alone or in combination with interferon, may induce acute interstitial pneumonia in chronic hepatitis patients. Despite the emerging of CAM on the markets, documented herb-drug interactions are still sparse, especially in relation to ALD with a reliance only on individual case reports. Although some combinations of CAMs and conventional drugs contribute many beneficial efficacies, some herb-drug interaction also may be associated with toxicity in certain situations such as the combination of silymarin with indinavir therapy in AIDS patients. It is undeniable that chronic alcohol abuse leads to deleterious implications for the liver regardless of age, gender or other factors. The more advanced the stage of alcoholic liver disease, the more morbid and life-threatening the complications become. Various therapies should, therefore, aim to reverse these complications but are often only palliative. As an initial therapy of ALD, abstinence from alcohol accompanied with basic lifestyle modifications when appropriate. When the injury becomes decompensated, pharmacological therapy should be accompanied to reverse the more severe stages of ALD. The present studies are still inconclusive with humble methodological quality and design, high heterogeneous patient populations, and poorly defined point of progression of ALD. These flaws may partly explain the conflicting reports in the literature to support the effectiveness of treatment for ALD for many conventional medications, such as Corticosteroids, PTX, and SAM. Mechanistic studies are still insufficient to prove their pharmaceutical potency and future studies will be thirsty to investigate the molecular mechanisms related in the complex relationships between ethanol metabolism, oxidative stress, immune response, HSC activation and extracellular matrix remodelling. Larger RCTs with a longer follow-up period are required for further evaluation. Increasing attention has been paid to herbal medicines as a newly emerging treatment strategy for ALD. In this review, we summarized functionalities of CAM for the prevention and treatment of ALD. Most single herbs and formulae have resulted in improvement of ALD-related conditions with multiple and diverse mechanisms of actions in spite of their mild side effects. To date, only a few active compounds from herbal extracts have been identified as candidates to treat ALD and alcohol induced liver injury. Although many herbal constituents have shown promising potential for the treatment of ALD with multi-targets, the underlying molecular mechanisms, especially that of single herbal compounds, have not been completely elucidated. Moreover, clinical trials to adjust concurrent systematic review are still required in the area of ALD research. More profound studies underlying the prospective effect of herbal medicines should be further investigated. In addition, some unique therapies are now increasing to develop the treatment of ALD. Epigenetic regulation underlying alcohol metabolism, such as histone modification may be a new trend to advance effective treatment strategies for ALD. Acetate may affect histone modification by up-regulating acetyl-CoA and enhance the inflammation in ethanol-exposed macrophages by interfering histone deacetylase activity. With many natural products potentially possessing this ability of epigenetic modification, it would be a particularly beneficial breakthrough for ALD patients.